So Who's Got The Most Cash In The Campaign Bank Among Louisiana's Gubernatorial Candidates? So Who’s Got The Most Cash In The Campaign Bank Among Louisiana’s Gubernatorial Candidates? Louisiana Gov. John Bel Edwards entered a three-month fundraising blackout for his reelection bid in a strong cash position, with the Democrat’s campaign saying Tuesday that he ended the latest donor solicitation period with more than $10 million in the bank. Edwards, the Deep South’s lone Democratic governor, will report raising more than $2.5 million in the fundraising quarter that ended April 5 when he files his report to the state ethics administration office, his campaign told The Associated Press. His Republican opponents, U.S. Rep. Ralph Abraham and businessman Eddie Rispone, haven’t yet released their updated campaign finance figures. The latest reports for the Oct. 12 election are due next week. Edwards’ $10.2 million cash on hand places him ahead of the $9.5 million that Republican former Gov. Bobby Jindal had in the bank at this point of his 2011 re-election bid. 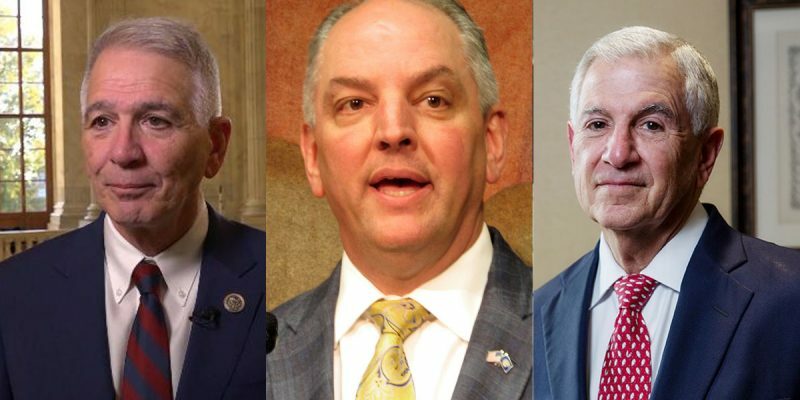 And the figure is larger than the $8.2 million that all four gubernatorial candidates had combined at this point of the 2015 governor’s race Edwards eventually won. The governor has raised $12.1 million since taking office in 2016, and 83% of donors live in Louisiana, his campaign said. Edwards packed in fundraisers in advance of the blackout for soliciting donations. He played up the ban in fundraising emails. Today Eddie Rispone for Governor announced the campaign will report over $10.4 million cash on hand for the fundraising period that ended on April 5th. “As the only conservative outsider in this race, and with more money in the bank than the Governor, Eddie Rispone is the Republican who can beat John Bel Edwards,” said Anthony Ramirez. How much of that cash-in-the-bank figure is Rispone’s self-funding, we don’t know. At his last filing, Rispone had self-financed $5 million of the $5.6 million he had in the bank; it’s a good bet he reloaded with a good $3 million or $4 million more. And Abraham, who’s going to show around $1 million in the bank when he puts out his campaign finance report next week, will argue that just because Rispone is spending his own money that doesn’t mean he has enough support to win. Which is a valid argument. On the other hand, what you’ll hear from a goodly number of Republicans is a concern whether Abraham can raise enough money to win being as though he’s from North Louisiana and a rural congressional district, and having never been a big campaign fundraiser before and so on. Abraham is going to need to make the most of his opportunity to raise money during the blackout period in which Edwards cannot, and he’s going to need to show strength in the polls that Rispone doesn’t in order to paint himself as the Republican who’s going to make the runoff. But if Rispone is willing to turn that $10.4 million loose with biographical ads and persistent messaging, it could make Abraham’s path to the runoff murkier. Either way, Edwards can no longer brag about his fundraising dominance. Somebody else in the race has more in the bank. Previous Article Boy, JBE’s Camp Sure Lost Their Cool Over Ralph Abraham Showing Up At The State Capitol, Huh?